Once the home of the notorious Devil's Island prison colony, French Guiana is now the nerve centre of the modern business. The giant Ariane stands on the launch pad. 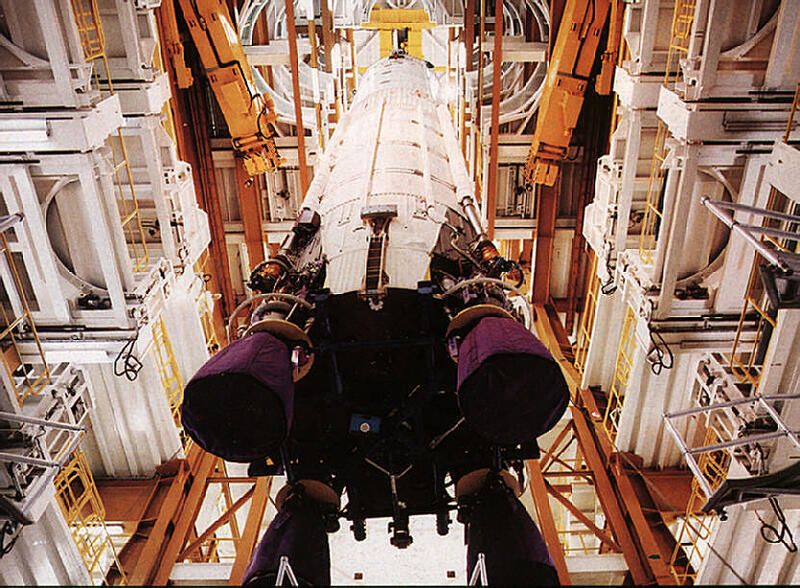 Two Satellites have been loaded into the compartment that forms the rocket’s nose, and lowered into place with infinite care. Six hours before lift-off, the cooling tower is trundled away from the rocket on its railway tracks. The satellite team do last minute checks. With two hours to go, the spacecraft is switched to launch configuration. The main count starts 30 minutes before blast-off. VIPs, mainly from the companies which have commissioned the launch, assemble at the viewing site, a grass mound 14 kilometres from the launch pad, offering not only an excellent view but an excellent bar. The tow satellite teams are also 14 kilometres away in the Technical Centre. The Mission Control team is in the Block House with its three-metre-thick walls, only one kilometre from the launch pad. Each member of the team is responsible for a different aspect of the launch. Six ground tracking stations around the world are on alert. The screens and panels gleam. Every desk has a button, and all must show green before the launch can go ahead: one red light and everything is called off. The tension before a launch is terrible. People joke nervously, but most are too wound up to laugh much. Years of work have been invested in making sure nothing goes wrong with the satellites. Yet everyone dreads a delay. Nothing is more frustrating than a delayed launch. The main threat is atmospheric: the launch cannot go ahead if there are high-altitude winds of lightening. A Kourou lightning is extremely rare, though only 30 miles inland the land becomes mountainous and can generate electrical storms clearly visible from the Space Centre. The final countdown is too long for anyone to hold their breath. Six minutes to go, and all clocks are stopped; the automatic sequence begins. When there are launchings at the Kennedy Space Centre at Cape Canaveral, the rocket starts to move at zero as the controller’s voice cries “we have lift-off’. But at Kourou there is an added moment of apprehension. After the end of the count nothing happens. The rocket’s engines are firing, but it takes another three or four interminable seconds, while the computers check that all engines have reached full power, before the rocket actually starts to lift. The mission team stays locked in the Block House for another hour. The fumes from the blast-off are so toxic that no one can emerge. Fourteen kilometres away, the satellite teams wait to confirm that the computers on board are working properly, then rush outside to watch Ariane streak through the sky. They can hear the tremendous roar of the engines and boosters. The sound shakes their stomachs. They watch the first stage of the rocket burn out and fall into the sea. They watch the huge flare as the second stage ignites. As a child, I used to gaze at the huge, red Hunter’s Moon that appeared on the horizon every few months. It seemed close enough to touch, and I wondered why the scientists did not send a rocket to the moon when it was right there to grab. It was an old dream. The Incas and the Aztecs dreamed it, the ancient Greeks with their Phoenix legends, Michelangelo with his intricate drawings of rocket ships which still attract as many visitors as his Sistine Chapel ceiling. Most people who are old enough can remember the first satellite, the Soviet Sputnik 1 in 1957, and the moment when Neil Armstrong stepped out onto the moon for the first time; people queued at museums all over the world to see bits of very ordinary-looking rock that had come from the moon. Today, space flight is big business. Billions of dollars are spent on building launch rockets, and billions more on their precious cargo, satellites costing up to $100 million. 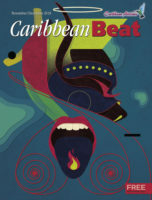 The Caribbean is not normally associated with rockets and billion-dollar industry. Little is known about the Space Centre in Kourou, French Guiana, owned by Arianespace. But it is the nerve centre of today’s space industry. 49 rockets, carrying 97 satellites, have been launched there since 1979. The space programme operates so smoothly and efficiently that there is a launch every six weeks. 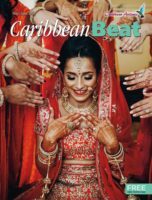 Why the Caribbean? Kourou lies on the South American coast just five degrees north of the equator. The closer to the equator, the better the precision of the launchings, and the longer satellites can live in space. The equator offers the shortest route to geostationary orbit, in which a satellite maintains a constant position over the same part of the earth’s surface. The earth’s rotation speed at the equator provides an extra push for the launching. Ariane can carry 15% more payload than rockets launched from Cape Canaveral, for example; it is also the only launch site in the world with a launch angle of 104 degrees, allowing Ariane to fly north for polar orbit or west for geostationary orbit. The temperature at Kourou might average 30 degrees, with saturating humidity in the wet season, but launch conditions are good: the equator is not prone to electrical storms or hurricanes. So Kourou gives Arianespace an enormous competitive edge in the multi-billion- dollar satellite launching business. French Guiana is a Department of France and Arianespace, a French joint stock company, operates the launch programme and is the landlord of Kourou and its surroundings. It has 55 shareholders, all from European countries; many of them are companies operating communications and telecommunications businesses, the major customers for satellites, though there are other customers too from all over the world. 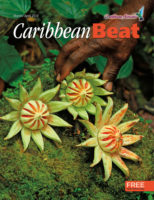 French Guiana is not a typical Caribbean country. Beyond the narrow coastal strip where the Space Centre is located and the population of less than 100,000 is concentrated, the landscape changes dramatically: rugged hills, rivers, dense rain forest. 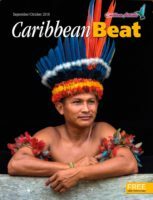 Bordered by Suriname and Brazil, this is one of the most isolated countries in South America. Most of its 33,000 square miles are under dense Amazon forest. Famous for Cayenne pepper (the capital is Cayenne), French Guiana is infamous for its penal colonies, especially Devil’s Island, described in Henri Charriére’s bestseller Papillon. Over 80,000 convicts were transported to this particularly brutal prison island between 1851 and 1946. These days, French Guiana produces sugar, timber, rum, beer– and rocket launches. Kourou employs over 10% of the population, is rich in restaurants and discos and boutiques, and is guarded by a thousand Foreign Legion troops. 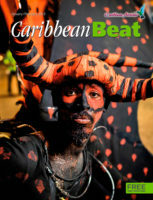 Its 18,000 people probably enjoy the highest standard of living in the Caribbean and South America. 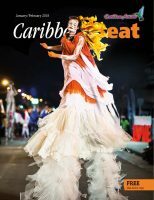 Kourou is on the coast, 60 kilometres from the capital Cayenne. Teams of skilled engineers and technicians arrive at the Space Centre two months before each launch. Each satellite requires a core team of about 12, with as many as 20 others arriving for short periods to undertake specific tasks. Each team has spent years designing and building the satellite to be launched at Kourou. A two-tonne satellite is worth anything up to $100 million, and is treated with infinite care on its journey to French Guiana. It flies to Cayenne in a special dust-free, temperature-controlled sealed chamber, with perhaps 20 pallets of equipment and accessories. 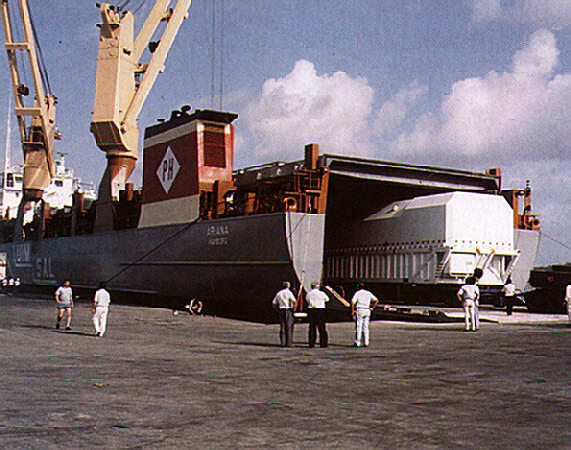 An enormous air- cushioned truck takes it very slowly to Kourou, taking three hours to cover the 60 kilometres to the Technical Centre. Ariane, the rocket, is over 60 metres tall; its nose can hold either one or two satellites plus a mini satellite, or up to six micro satellites. A specially built ship, Ariana, delivers the rockets from Le Havre in France, taking 11 days for the Atlantic crossing to French Guiana. There are always two Ariane rockets at Kourou, one in preparation in the assembly bay, the other on the launch pad. Ariane is a three-stage rocket, carrying 226 tonnes of fuel and powered by four Viking engines. At lift-off, thrust is 500 tonnes, equivalent to all BWIA’s TriStars taking off simultaneously. During the first stage, Ariane uses a tonne of fuel each second. 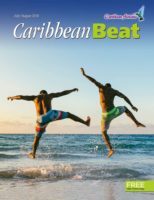 Satellites in geostationary orbit 22,000 miles above the equator have quite an influence on our lives, especially in the Caribbean. They bring us live coverage of events like the Olympic Games; they relay news and TV entertainment. They speed up overseas telephone calls and facilitate mobile communication from planes and ships. It is a rapidly growing industry, and demand for satellite launches is fierce. To avoid a free-for-all, an International Global Space Agreement was drawn up. The geostationary orbit at two and a half times the diameter of the earth was divided into “parking spaces” for satellites, with two degrees between each space to prevent interference. There are only 180 spaces, each one a 40 kilometre cube, some accommodating two satellites in co-location. In the early stages, the King of Tonga, in the South Pacific, moved faster than almost anybody else and snapped up the remaining parking places, auctioning them off to the highest bidder. Sadly for Tonga’s treasury, a revision of the Global Space Agreement put an end to the scheme. A launch mission is an immensely complicated process. A satellite might take two years to build, but must be ready, tested and in perfect working condition for a launch scheduled long before. It must have its parking space allotted and its flight booked on Ariane. With a ticket costing up to $100 million, you can’t afford to be casual about travel arrangements. Before leaving for Kourou, each satellite is put through a launch simulation. In an acoustic chamber with four speakers each as big as a room and producing 150 decibels for one minute (the vibrations from the noise are so powerful that they would kill a human being on the spot), any loose sprockets would rattle loose in no time. 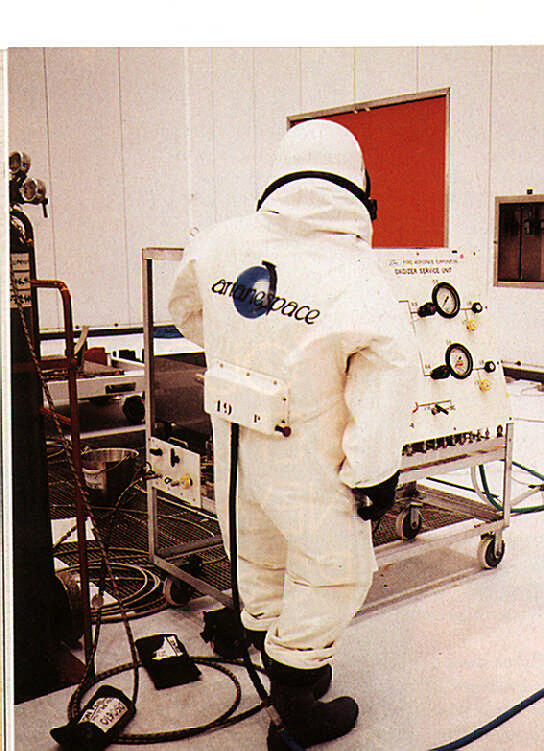 Another test is the solar simulator, a vacuum chamber to test performance in space. It is vital to prevent any speck of dust or fingerprint smear from touching the satellite’s surfaces: a microscopic dust speck can affect its performance in space. Jim McIlwaine and Andrew Davidson of British Aerospace, one of the major contractors for the Ariane rocket, are satellite engineers and veterans of Kourou rocket launches. They recently waved goodbye at Kourou to their latest baby, the INMARSAT 2 F3 satellite owned by International Marine Satellite Telecommunications. For a month, the team works six days a week, from eight in the morning till six or seven in the evening. The day begins with a morning meeting with the Mission Manager, who is responsible for the preparation of the Ariane rocket and INMARSAT’s co-passenger, TELECOM 2A. The fuelling takes four days. In the meantime, the core team have some time to themselves: beach barbecues, sailing, game fishing, windsurfing, clay pigeon shooting, football. 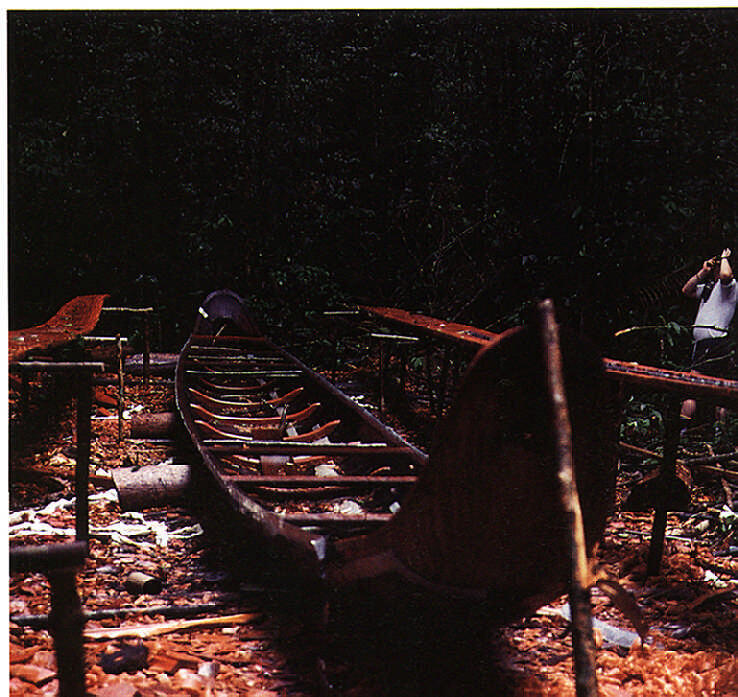 Some make trips into the Amazon jungle, where local Guianese can fell a giant hardwood and turn it into a dug-out canoe faster than the space technicians can count down a rocket launch. The Iles de Salut, or Salvation Islands, are another popular excursion. A ferry goes to the largest island, Royale, and a speedboat can be hired to explore all three. “Hot-shot windsurfers do the 28-kilometre round trip on their boards,” Jim McIlwaine says. Devil’s Island is largely unapproachable, with no jetty or beach, and is surrounded by huge rocks; the boat drops you in the sea close by and you swim ashore and clamber up. 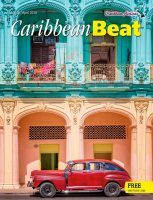 Jim McIlwaine mistimed the waves and found himself swept against the rocks, clambering onto the island battered and bruised. 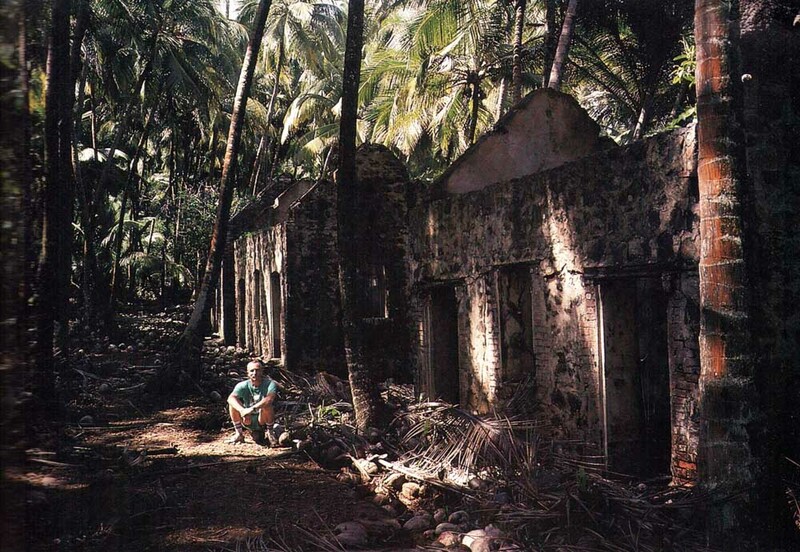 The ruins of the old penal colony stand in the jungle. Walking is awkward be-cause the ground is two feet deep in old coconut shells. The pigs from the old colony have bred and their descendants crash around the island, digging through the shells. Fully fuelled, the satellite moves into the final stage, the Combined Operations Programme. The morning meetings now include both satellite teams and their customers, plus the Ariane preparation team. There is only a week to go. Once in space, each satellite keeps itself alive and functioning with solar power from the solar arrays along the 50-foot wings. But this solar energy is not enough to fly the craft. Hence the fuel tanks. For each spacecraft has to be flown into position in its parking lot on the geostationary orbit. But satellites have no brakes: they can be neatly parked by Ground Control, but may be buffeted by solar winds, dislodged by the wobbling of the earth’s gravitational force or by the sun. Every time the satellite moves from its position it must be brought back with burn manouevres, using up precious fuel. Solar power will keep the satellite alive forever, but the fuel to fly the craft will eventually run out. Satellites launched from Kourou have a life expectancy of eight to 12 years in geostationary orbit, but each burn manoeuvre reduces it. The spacecraft has two “eyes” like telescopes, permanently gazing at the earth; from 22,000 miles up, our planet looks 30 times bigger than a full moon. If one eye cannot see the earth, it means the spacecraft has moved radically out of position, and Ground Control comes to the rescue as fast as possible. When the satellite is released by Ariane, it does not automatically go into geostationary orbit. Initial orbits are in a sausage shape, 200 miles from the earth at one end and 22,000 miles at the other. Ground Control has to move the spacecraft out of this initial orbit into its assigned parking place. It can take up to two days and 10 sausage orbits for the manoeuvre to be completed. And there must always be enough fuel left for the final ejection into space. 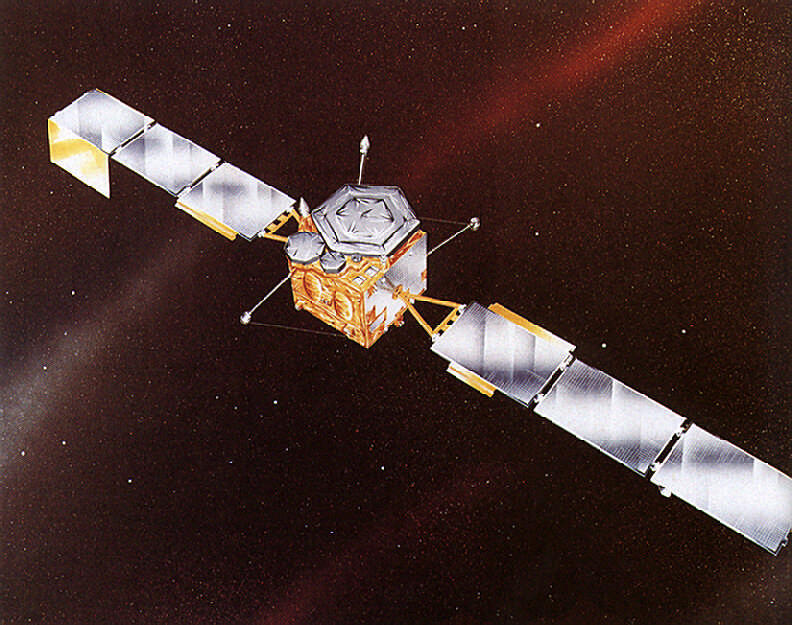 At the end of a satellite’s life, Ground Control will blast the satellite right out of its parking place into outer space; there is always another satellite ready to replace it. The dead satellite will roam around space forever, a space derelict. After a successful launching come another tense 48 hours. The baby has been launched into space, but its minders are still worried about how it will manage without them, all on its own. It takes 18 minutes for Ariane to reach the nearest point of geostationary orbit. Now a remarkable space ballet takes place, though no-one can see it and it has never been filmed. It takes three minutes for Ariane’s electronic brain to order a series of manoeuvres to launch the satellites on their independent life in orbit. Each shell around the spacecraft opens up like a lotus flower, and the satellite emerges. Its wings spring open like a jack-in-the-box, and the antennae for communicating with Ground Control move into place. The satellites must be parked in their assigned places as fast as possible. They must be guided out of the sausage orbit using as little of the precious fuel as possible. Jim and Andrew describe this phase as a series of heart attacks, as they wait for their baby to emerge, open its wings and manoeuvre into final position. “You think you can’t take any more. The jubilation at each stage hits you like a sound blast. Then you feel your stomach quivering again and this time it’s not from the noise.” It is common to see team members close to tears of tension, jubilation and emotion. But then it is done. The satellite is in position, working perfectly. Ariane has carried out another successful mission. 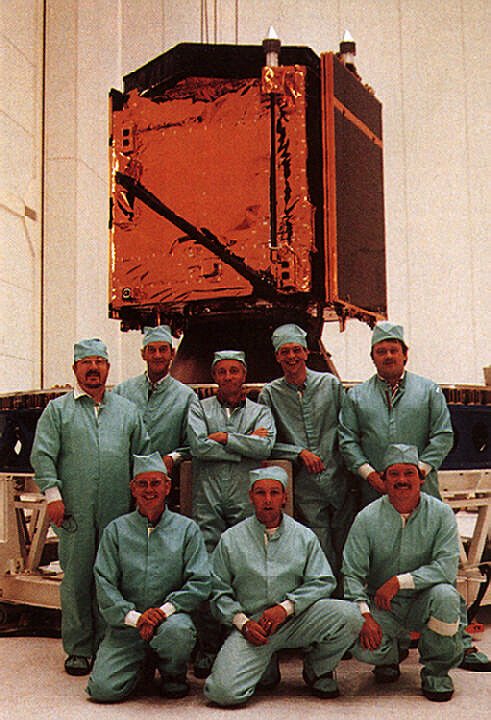 The satellite teams usually stay another week at Kourou. There is, after all, celebrating to be done.